The boundary map of the City of London has step at it’s Northwest corner. This is because the Fortress was built before the walls were planned and the stone structure was square. The City walls were added at a later date and the fort left in place to form a part of them. The fort was constructed around the year AD 120 and the walls were started roughly 80 years later. The material used to build the walls was Kentish rag-stone. 85,000 tons of it transported down the river Medway and round the coast into the Thames. The remains of a Roman sailing barge were found in the Thames in 1962. It seems it was wrecked close to the mouth of the Fleet River near where the present Blackfriars Bridge stands. Some of it's cargo of rag-stone was still on the vessel. It’s generally believed now that the fort was built as a barracks rather than for defensive purposes from outsiders. 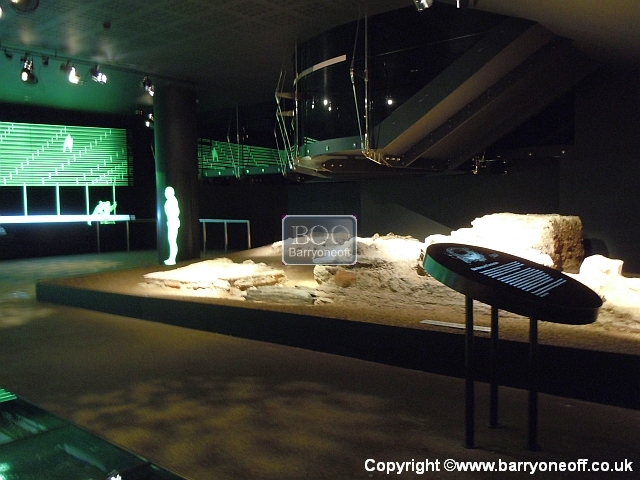 After the Iceni uprising led by Boudica destroyed the initial settlement in 60-61 AD work began to rebuild it. The smaller buildings would have sprung up everywhere for the occupying forces to live and they would have been built in the style of continental villas. Most of the occupying forces would not have been true Romans but mercenaries recruited from the continent, especially Gaul. They would have also made deals with tribal leaders in Britain. The appointed civil governor, or procurator, proclaimed that no reprisals be made against the population after Boudica was killed, and so the building work continued. A basilica and forum were built around 70 AD followed by a second, thirty years later. This stood roughly underneath the site that Leadenhall Market now occupies. It was demolished around 300 AD. The basilica comprised of a great hall with knave and aisle, a raised platform for judges and a double row of offices. This was the town hall and law courts. The forum was an enclosed area at the South end of the basilica with shops, offices and market square. The buildin g of the City walls began circa 190 AD and the fort was merged with them. The new walls were about 9 feet thick, twice the thickness of the fort walls, and around twenty feet high. The Kentish rag stone was tied with a layer of terra-cotta tiles every three feet or so to bond the wall. A ditch was dug around the wall and the removed earth used to shore up on the inside. This wall stretched for two miles around the settlement with six gates giving access. 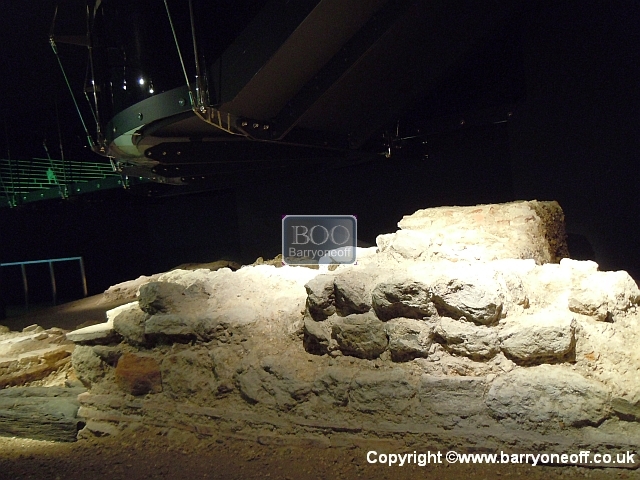 The seventh gate (Moorgate) wasn’t added until the medieval period. In the third century the river wall was added. In the fourth century twenty bastions were added to the East wall. The reason why is not clear but they seem to have been in a hurry, as tombstones and other items were included in the building materials. 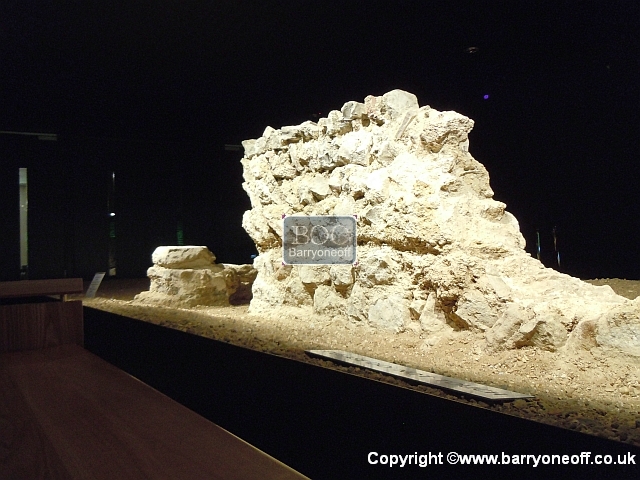 When the fort wa s built circa 120 AD as a garrison, the Roman forces had become a large part of Londinium's population. It is estimated that it housed around 1,000 men. It was situated at the North West of the settlement where the present Wood Street, on the North side of Gresham Street, runs roughly through the centre of the site. The fort walls were about four feet thick and fifteen feet tall with rounded bastions on the corners. 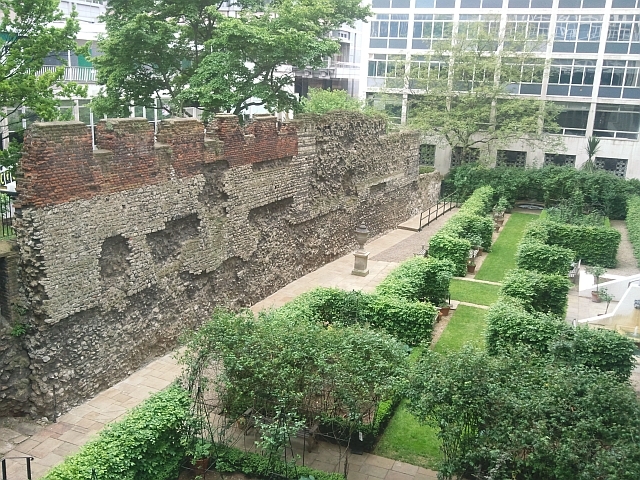 The Northern entrance to the fort was later to become Cripplegate and the Western gate would eventually be bricked up and replaced by Aldersgate. 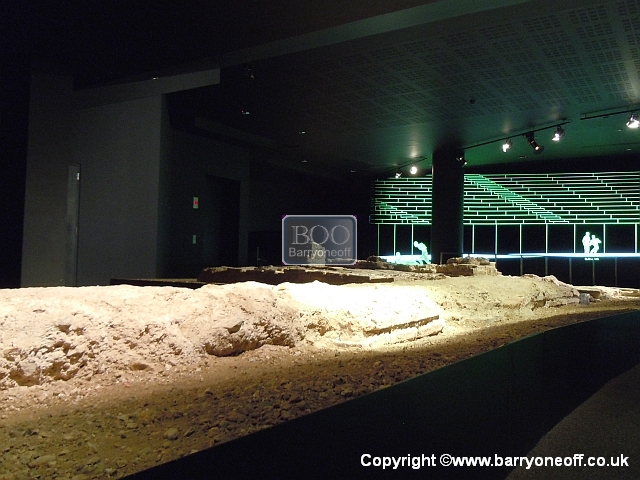 You can still see the remains of medieval bastions that were built on top of the Roman ones which were gradually covered during the centuries the city was deserted when the Romans left in 410 AD. These are known as the Dark Ages. The Roman A mphitheatre was known to exist but nobody knew where it was! 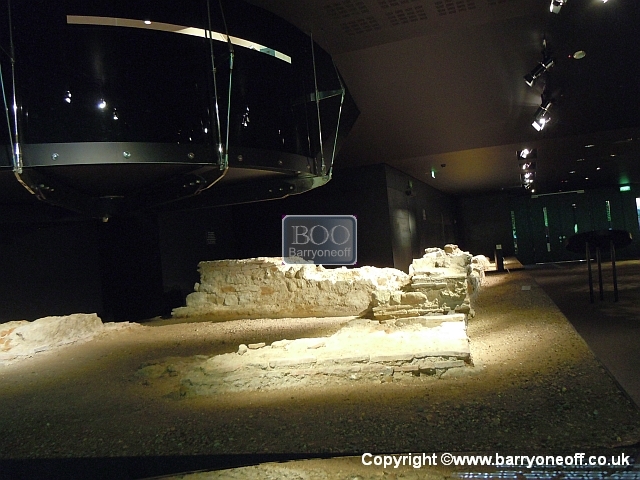 In 1988 during excavation work for the building of the new Guildhall Art Gallery it was discovered under Guildhall Yard. Work was halted for a few years delaying the opening of the gallery. Most remains buried but a section under the gallery was made into an exhibition. 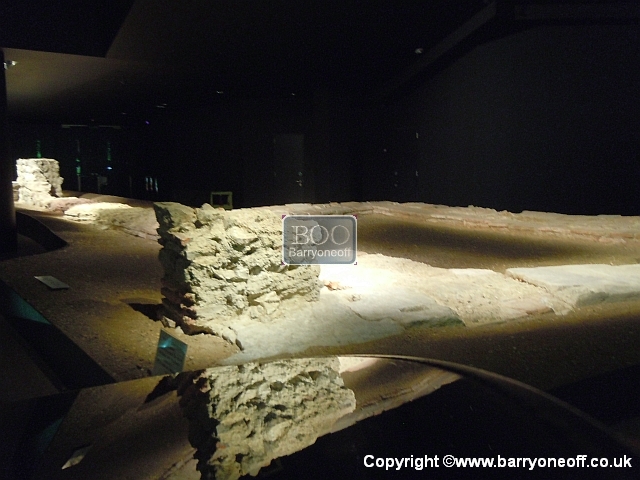 A slate circle laid into the tiles of Guildhall yard shows the circumference of the amphitheatre.